In our January blog post, we explored the question of when to retire—more specifically, the portfolio implications of retiring at what could be the beginning of a bear market. In light of recent volatility in public markets and anticipation of a long overdue downturn, sequencing risk is of particular interest to clients approaching or considering retirement—and understandably so. Cash (or cash equivalents) to be used for the upcoming year or two of expenses. This provides a regular source of cash without feeling pressured to liquidate other investments at an inopportune time; instead, those assets can stay invested while waiting for the market to rally. Bonds and fixed-income investments, which are less prone than stocks to suffer significant market downturn. A properly structured bond portfolio can serve as a well-defined annual source of investment income to help replenish Bucket 1 if needed. Stocks (or other equity investments) to sustain the nest egg for the long term. When market performance exceeds expectations, the excess appreciation can be used to replenish Buckets 1 and 2 if needed. On the other hand, when performance disappoints, Buckets 1 and 2 carry you through without having to sell stocks at a point of lower (or no) returns, providing critical peace of mind to stay the course and ride out market volatility. Spending needs change over time, and the same is true during retirement. Perhaps you hope to enjoy lower budgetary needs now that the kids are grown; perhaps your medical costs will unexpectedly rise in the years to come; or perhaps you hope to celebrate your freedom with an extravagant trip abroad. We strongly encourage all our clients – not just those facing possible sequencing risk – to take a hard look at how they currently spend their money, set honest expectations around how those budgetary needs might change (for better or worse) during retirement, and quantify the cash flow realistically needed to retire. During this exercise, build in flexibility by identifying any items which might be postponed or eliminated should the market turn (for example, that trip abroad can probably wait, while medical expenses probably can’t). Additionally, withdrawing a percentage of your retirement funds each year – rather than a fixed amount – further mitigates sequencing risk by reducing the impact of your withdrawals on top of the impact of lower returns. However, this strategy requires that you be able to live within a spending range that might fluctuate from one year to the next based on market performance, rather than adhering to a fixed annual budget. Be thoughtful when prioritizing accounts for withdrawals. While fulfilling your Required Minimum Distribution amounts from your IRA or 401(k) comes first, consider following with more tax efficient non-taxable withdrawals from an HSA or Roth account. Individual situations may vary, so be sure to work with a tax advisor to optimize the impact on your tax liabilities. Take stock of any assets you may have that can be used, if necessary, to buffer cashflow shortfalls during a market downturn. Consider the cash surrender value of a life insurance policy, or selling that rarely used lake house. Despite the negative reputation of reverse mortgages, there are situations in which even these can be effective tools for supplementing retirement income. Of course, you may choose to employ one, two, or all of these mitigating strategies to best prepare yourself for retirement, even if the market’s timeline doesn’t seem to align with yours. When in doubt, always seek the advice of a professional who can help you weigh your options and develop a thoughtful, well-rounded retirement plan that ensures you spend those golden years focused on filling the soul, not the coffers. For disclosures, please click here. Retirement: it’s a phase of life many look forward to, but it’s also one of the hardest to plan. Sure, there’s the question of how much, often referred to as your “number”—the amount of savings you’d need to be able to comfortably retire. Conventional wisdom has long relied on the “4% Rule” to help hopeful retirees calculate this number: the annual income you want or need throughout retirement (not including Social Security income) should represent 4% of your total savings upon retirement. So, if you’re targeting $150,000 in annual retirement income, you’ll need $3.75 million saved the day you retire. While this rule of thumb may be helpful in its simplicity, that simplicity can leave many ill-prepared for the financial realities of retirement. While the 4% Rule asks how much, it doesn’t ask how long. The 4% Rule assumes a 30-year retirement. If you don’t expect to live that long, perhaps you don’t need the full $3.75 million. Then again, if you midjudge your longevity, you could deplete your savings years too soon. The 4% also doesn’t ask how you expect to live during retirement. In our experience, clients often underestimate how much their current lifestyle really costs, while they overestimate their ability to remain healthy and independent as they age. Perhaps most importantly in our current market, the 4% Rule fails to ask when. And when it comes to retirement, it’s not just a question of how big your nest egg is. It’s also a question of when you crack it. Let’s suppose for a moment that you’ve worked to accurately quantify your retirement needs. You’ve even built in some you wiggle-room for unexpected expenditures. You feel confident in your $3.75 million nest egg number, and you plan to withdraw $150,000 a year. So long as the market is able to return 5% on your investments, your calculations tell you you’re headed for a long, financially secure retirement. However, in your second year of retirement, the market takes a significant downturn. Suddenly, instead of the 5% return on your investment you’d planned for, your portfolio is now yielding a -12% return rate, as you continue to make withdrawals. After several years, the market rallies, and over the course of your entire retirement, your portfolio still manages to average 5% returns over time. However, averages can be deceiving. 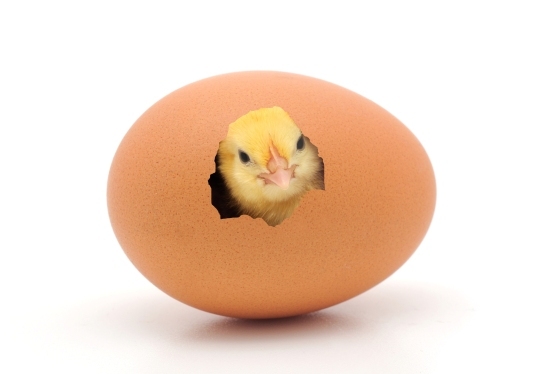 Thanks to that drop in the market early in your retirement, you ate into your nest egg at a faster rate than anticipated, meaning any future market gains were made on a smaller egg. The earlier in your retirement you face a bear market – or worse, a recession – the more magnified is its negative impact and the harder it is for your savings to rebound. This is known as sequencing risk, and it’s of particular concern to those looking to retire just as the market prepares for a downturn. The fourth quarter of 2018 was certainly such a downturn, and there continue to be predictions of a deeper bear market and possibly a recession. And while it’s unclear if or when these predictions will come true, those approaching retirement must consider if, when, and how to do so in the face of such uncertainty. Some may decide to continue working to provide extra cushion for their nest egg. For those who cannot or don’t want to wait, there are specific strategies we recommend for mitigating sequencing risk, including asset allocation strategies, distribution or “bucket” strategies, and flexible spending strategies. These contingency plans will be explored in subsequent blog posts; please stay tuned. What are Multiple Employer Plans (MEPs)? Multiple Employer Plans (MEPs) have been around for decades, yet, many people have never heard of this type of retirement plan. A multiple employer plan is a plan maintained by two or more unrelated employers. MEPs are often coordinated via a trade or business association. For example, an MEP could be sponsored by a state dental association or a group of companies spread across the U.S. that share a common nexus, such as auto part manufacturers. Why consider forming an MEP? Let’s expand upon the concept of an auto manufacturer MEP. Taking advantage of economies of scale, each auto manufacturer that adopts into the MEP shares in the benefits of its collective structure. By pooling their investments, administration and governance structure, the MEP members could garner greater efficiencies and purchasing power. MEPs are formed to minimize costs while adding value-added services, typically offered at a premium to stand-alone retirement plans. Just as important, plan sponsors can often minimize their fiduciary liability by participating in an MEP. What are some of the main benefits of MEPs? Though you may not have heard of an MEP, they are quite common in the corporate 401k space. They are also gaining popularity with legislators, who want to provide coverage for small businesses (regardless of a common nexus) that are not offering employees any type of vehicle for retirement savings. These are called “open” MEPs and a timely reference is the Retirement Enhancement Security Act (RESA) of 2018. Further, we are seeing higher education organizations create MEPs that are structured as a 403(b) plan rather than a 401(k). For example, 14 independent colleges in Virginia recently decided to create their own MEP to share in the outsourcing of education and advice, the monitoring of investments and fees, administration and fiduciary responsibilities. MEPs come in all shapes and sizes and even offer sponsors flexibility with different plan designs. However, MEPs must adhere to certain plan qualification rules under IRC 401(a), such as with vesting, eligibility and distribution rules. In other words, some of the rules may apply to the aggregate plan while others to the adopting plan sponsor. Here is additional insight. Hopefully, you now know a little more about Multiple Employer Plans and don’t confuse them with other plan types. Quite often, people mistakenly refer to them as Multiemployer Plans, which are those created for unrelated companies covered under a collective bargaining agreement. But, that is a whole other story. https://www.thirtynorth.com/wp-content/uploads/2017/04/LOGO-ThirtyNorth-Rev2017-1.png 0 0 Jonathan Epstein https://www.thirtynorth.com/wp-content/uploads/2017/04/LOGO-ThirtyNorth-Rev2017-1.png Jonathan Epstein2018-04-23 13:28:102018-04-23 13:28:10What are Multiple Employer Plans (MEPs)? The Biggest One Day Loss Ever…Really? After the recent volatility in the market, I once again recall a few reasonable tips that help me maintain a long-term focus on investing. Tip Number 1 – First, although you may be watching the “financial” news or an “investing” expert on your local news, remember they are selling news first and foremost and shock value sells. I always remind myself to take what I hear with a grain of salt. Don’t get me wrong, I gather valuable information from the financial media. However, when, like on Monday, February 5th, I hear experts on the news discussing the fact that the Dow dropped the most ever in a day, I take pause. What does that really mean? Once a drop in the Dow of 250 points seemed large, but is now only a 1% move. This may feel painful when you look at your account balance, but volatility of this nature is normal in the stock markets even if we haven’t experienced it in a while. As Blair duQuesnay, our Chief Investment Officer, reported Monday, February 5th, the 1,175 point drop, when measured in percentage terms, was not in the top 20 historical one day moves for the Dow (https://youtu.be/me7449asL_c). In addition, the Dow is comprised of 30 mega-cap industrial US companies. In today’s global world, this is a narrow list of companies used to measure a much larger universe of stock investment options. While the Dow is a quick proxy to the markets that is discussed prolifically, for globally diverse investors with holdings in different asset classes including bonds and alternatives, a deeper dive is prudent on these days that are characterized in the press by fear and doom. Tip Number 2 – This brings me to my second tip which is that you haven’t lost money in your account unless you sell. I often hear pundits on the news talking about how much the market lost in a day. The correct word, in my opinion, should be the amount the market declined. Then, it might be easier to remember that over the long-term, back to the 1920s, the market has been on a steady incline only temporarily slowed by short-term declines. Yes, the value of an investment on a given day may go down or up, but it is the long-term that really matters. Historically, on average over the long-term, the stock market has gone up delivering positive returns in spite of days that get mischaracterized as the worst down day ever. If, in a moment of fear, you sell, then you have locked in the loss. However, if you hold for the long-term and achieve the expected growth, you should recover the temporary decline in value and more. Owning a diversified portfolio that includes investments in different asset classes all over the world can effectively help manage the volatility of a portfolio as a whole when one asset class, like stocks, is suffering a temporary decline. I included the cartoon above hoping to make you laugh, but also because many investors feel the market ups and downs most acutely in their 401(k) accounts. Fear raises its ugly head here almost more than anywhere because we our retirement savings are at risk. However, taking an appropriate amount of risk in your investment accounts is paramount to achieving a successful retirement. This is why diversification is important to control the volatility while maintaining the right level of risk in your investment strategy. 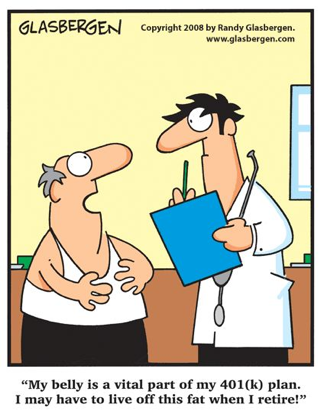 Remember, it is time in the market that matters not timing the market that is most likely to help prevent us from having to live off our belly fat in retirement. https://www.thirtynorth.com/wp-content/uploads/2017/04/LOGO-ThirtyNorth-Rev2017-1.png 0 0 Fritz Gomila https://www.thirtynorth.com/wp-content/uploads/2017/04/LOGO-ThirtyNorth-Rev2017-1.png Fritz Gomila2018-02-09 15:47:332018-02-09 15:49:45The Biggest One Day Loss Ever…Really? What do Gucci, CenturyLink and Fujitsu have in common? Read On! I continually write on fiduciary issues and am very amazed by the number of lawsuits still being initiated and settled. The trend is certainly not slowing down and fiduciaries, beware. Please note that even though the service provider’s name is often in the headlines, it is the plan fiduciaries that are being sued. Additionally, I notice that the size of the plans being sued are getting smaller, meaning no longer are just the mega-plans being targeted. According to the Investment Company Institute (ICI), 401(k) plans held $5 .1 trillion in plan assets as of June 2017. With these dollars, it`s not difficult for plaintiff attorneys to be motivated to get creative with the types of suits being brought against fiduciaries. Many of the newer fiduciary breach suits against corporations, universities and plan providers involve poor decision-making for both the selection and monitoring of investment options and breaches in administrative decision-making. In addition, the suits go beyond just the use of expensive share classes and are now delving into investment strategy and sub-par performance. As a reminder, 401k) plan fiduciaries are subject to strict duties of prudence, loyalty and avoiding conflicts of interest and acts of self-dealing. Another important fact to the Gucci 401k) suit is that the plan assets are only $96 million, far less than the plans typically involved in these types of cases. This should serve as a warning to plan fiduciaries that regardless of your plan size, the fiduciary standards are uniform and applicable to ALL plan sponsors. https://www.thirtynorth.com/wp-content/uploads/2017/04/LOGO-ThirtyNorth-Rev2017-1.png 0 0 Jonathan Epstein https://www.thirtynorth.com/wp-content/uploads/2017/04/LOGO-ThirtyNorth-Rev2017-1.png Jonathan Epstein2017-12-20 13:47:162017-12-20 16:15:44What do Gucci, CenturyLink and Fujitsu have in common? Read On! As you may recall, we have written previously on the importance for retirement plan sponsors to better understand their responsibilities under ERISA to more effectively operate their plans. In my opinion, it is no longer prudent to default to actions being/not being taken by plan vendors not serving in a fiduciary role. ERISA specifically requires fiduciaries to adhere to a duty of loyalty, a duty of prudence, a duty to diversify plan investments and to not engage in any prohibited transaction, unless exempted. Do you know which of your plan vendors are serving in a fiduciary capacity, and if so, to what extent? A recent special report written by Lars Golumbic, of the Groom Law Group, discusses the types of lawsuits being brought against sponsors and offers some suggestions on reducing ERISA risks. When meeting with clients to discuss saving for retirement, I often note that two of the most critical elements to building wealth for use in retirement are 1. starting early and 2. saving as much as possible. After all, the goal is to develop sources of income for use in retirement as a replacement for a paycheck. Understanding that fact is step one, in my opinion, to beginning to develop a plan. Sources of income in retirement can include Social Security, retirement accounts like 401(k) or IRA accounts, rental property, etc. In the world of investing and, in particular, investing for retirement, you might easily become confused or frustrated by what seems a daunting task complicated by industry jargon. Frustration might arise because the goal of financial security seems unachievable. Concepts such as retirement readiness (an often used term for saving enough to retire) might create confusion. Further, assessing the potential types of retirement accounts to use could lead to indecision. The Roth 401(k) became eligible for plan sponsor use over ten years ago, in 2006. However, it startles me that only an estimated 58% of employers offer this feature to their plan participants (Roth 401(k) uptake). The 2017 Roth 401(k) contribution limits dwarf the limits of a Roth IRA contribution. The Roth 401(k) employee elective contribution limit is $18,000. Participants over age 50 can make an additional “catch-up” contribution of $6,000 (total of $24,000). There are many benefits to contributing to a Roth 401K) and I have listed them in bullet point format below. But one key advantage is their tax-free withdrawal. Participants with large 401(k) balances amassed through traditional pre-tax contributions should start hedging their tax liability. Roth 401(k) withdrawals (both contributions and earnings) are not taxed provided it`s a qualified distribution. To qualify, a distribution must be held for at least five years and made because of the attainment of age 59 1/2 or later, a disability, or upon death. 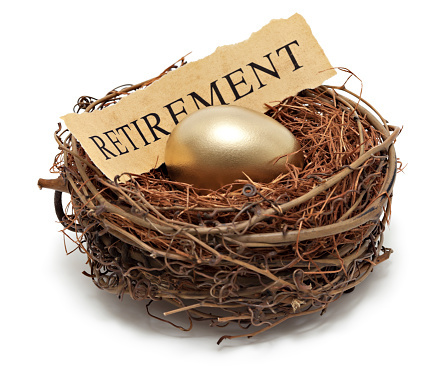 Please note, that Roth IRAs do not have Required Minimum Distributions (RMD) at age 70 ½. To take advantage of this benefit, your 401(k) plan may allow rollovers of your Roth 401(k) balance to the Roth IRA. This will reduce your total 401(k) account balance and thereby reduce your RMD amount. If your 401k plan already has a Roth feature then I suggest contributing to it immediately, even if it is only a one-time contribution. The five-year qualified distribution clock starts ticking from the date of initial contribution. Five years is a requirement to make qualified distributions. Starting the clock earlier than later can help toward satisfying that requirement. Many of us are unsure of which tax bracket we may fall into at retirement and/or what tax brackets will be in the future. Building a pool of Roth 401(k) assets helps avoid taxable distributions on a portion of withdrawals in the future. Avoiding taxes is an effective way to help achieve retirement success. Check with your employer if the Roth feature is available in your 401(k). If not, then perhaps you should inquire further as to why not. Have Defined Contribution Plan Fees Hit Rock Bottom? So, are the survey results showing a potential bottoming–out in plan fees? In my opinion, providers and other retirement plan stakeholders are now balancing the scale on costs vs. the value being delivered to plan sponsors. Being viewed in a commoditized fashion is not the goal of any plan recordkeeper. Logically, DC plan recordkeepers can only lower fees so much until they start reacting with lesser services and customization. It appears there have been two primary forces behind the seven-year long downward trending in DC plan fees. First, fee litigation has certainly put sponsors on alert and has prompted them to know not only what the fees are in their plans, but how they are actually being assessed (i.e., revenue sharing). The second driver was the Department of Labor`s ERISA 408(b)(2) fee disclosure regulation that was implemented in 2012 mandating plan sponsors to proactively determine fee reasonableness. https://www.thirtynorth.com/wp-content/uploads/2017/04/LOGO-ThirtyNorth-Rev2017-1.png 0 0 Jonathan Epstein https://www.thirtynorth.com/wp-content/uploads/2017/04/LOGO-ThirtyNorth-Rev2017-1.png Jonathan Epstein2017-08-28 20:33:382017-09-20 15:44:25Have Defined Contribution Plan Fees Hit Rock Bottom?